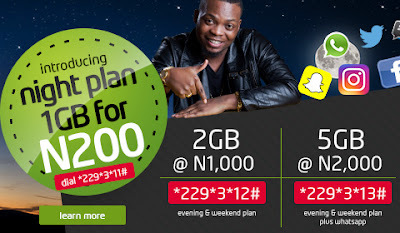 Etisalat has just introduced a new night and weekend data plan which gives you 2Gb data at N1,000 and 5Gb data at 2,000 which also comes with WhatsApp data bonus which can be used at any time of the day. If you recall, etisalat also introduced a midnight plan of 1gb for N200 not quite long ago which many subscribers called outrageous because it was too expensive compared to what other service providers are offering. Etisalat is the only telecommunication industry in Nigeria which is currently offering a night and weekend data bundle. You can use this plan on weekdays (Monday -friday) from 7p.m to 7a.m and for the whole day on weekends (Saturday - Sunday). And it will last for 30 days. ==> Make sure you have sufficient airtime on your etisalat line. ==> Simply dial *229*3*12# to subscribe. ==> The plan is valid for 30 days. ==> Both plans are active on weekdays(Monday -friday) from 7p.m to 7a.m and also for the whole day on weekends(Saturday&Sunday). ==> You will be given bonus 100mb to chat on WhatsApp for the whole day both weekdays and weekends. ==> Both plans are valid for 30days. Seriously all other network has a bad reception where you reside, I don't see any reason why anyone will pick this data over any of the other affordable data plans provided by other ISPs most especially Glo. This new etisalat weekendsl/night plan is very outrageous just like the recently introduced midnight plan.